Most businesses don’t know how much they spend on print-related costs or how their printers are being used. This makes it very challenging to optimise the print environment and identify opportunities for reducing costs, security compliance and increasing productivity. 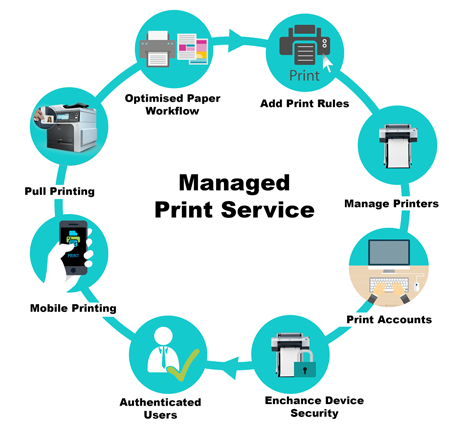 Our print management service will ensure your print environment will be more cost-efficient, productive and secure. Our complete range of Multi-functional printers combined with comprehensive reporting enables your business to implement a optimum-sized printing environment that works more efficiently. Users can make full use of printer capabilities with easy-to-use features that make printing, copying, and scanning easier and more convenient – such as pull printing, favourites folders, mobile printing from any location, and more. Easy user authentication at printers, secure print queues, rule-based printing, and user roles ensure that sensitive documents and information are always protected. Our print management solution will help your organisation to eliminate waste of all kinds with better cost accounting, fewer unnecessary print jobs, and more environmental savings.